Starting from Naxos town and through the village of Galanado and the tower of Belonias, we stop at Damalas pottery workshop. Then through the valley of Tragaia and we stop at the village Halki with its mansions, the Byzantine church of Panagia Protothroni and the citrus distillery. We continue to Panagia Drosiani. Next stop is Apiranthos village with its marble paved alleys. Apiranthos has 4 small museums. The Archaeological Museum mainly hosts findings of the Proto-Cycladic period, the Geological Museum with its approximately 2,000 exhibits, the Natural History Museum with a collection of the area’s fauna, flora and a small aquarium, while the Folklore Museum displays traditional fabrics, embroidery and tools. Passing by the villages of Koronos, Skado and Mesi, we arrive at the northern village of the island, Apollonas, where there is an unfinished Kouros statue. Time for lunch and swimming. 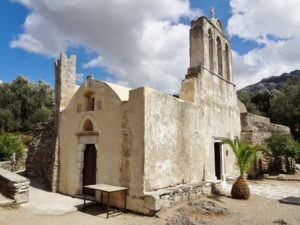 We return to town by the northwestern costal road where we find the Tower of Agia, the monastery of Faneromeni (17th c) and the villages of Eggares and Galini.